The center console box is used for storing cassette tapes or small articles. 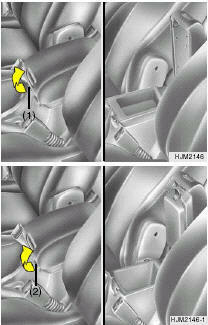 To use the center console box, pull up the handle (1) or (2) lift the lid as shown. To avoid the possibility of injury in case of an accident or a sudden stop, the center console box lid should be kept closed when the car is in motion. The center console box can be used as armrest. To use the console armrest, pull out the console box lid by pulling up the handle as shown. When not in use, always be sure it is locked in position properly. Do not place cups or cans in the drink holder when the console box lid is used as an armrest. It may result in spilling the beverage. A spilled beverage that is very hot can injure you or your passengers. 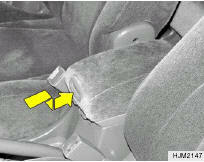 Spilled liquids can damage interior trim and electric components.